September 18, 2018 – A report released by Integrity Florida mentions that charter schools are more likely to get an A rating from the state (42 percent versus 30 percent) or an A or B rating (65 percent versus 57 percent), yet the report also provides misleading information and paints a picture that is not representative of the successes charter school students are experiencing in Florida. In 65 of the 77 comparisons, students enrolled in charter schools demonstrated higher rates of grade level performance (scoring a level 3 or above on the statewide assessment). The percentage of students making learning gains was higher in charter schools in 82 of the 96 comparisons. In 22 separate comparisons, the achievement gap was lower for charter school students in 20 of the comparisons. The achievement gap section of the report contains data that are used to analyze the learning gap between white students and African-American students, and white student and Hispanic students in English Language Arts, Mathematics, and Science and Social Studies. It’s also important to point out that charter schools are not creating a parallel public education system that largely operates outside of local control because almost all charter schools are authorized by their local school district, and all are required to submit academic and financial reports to their district authorizer, on a yearly, and sometimes quarterly, basis. 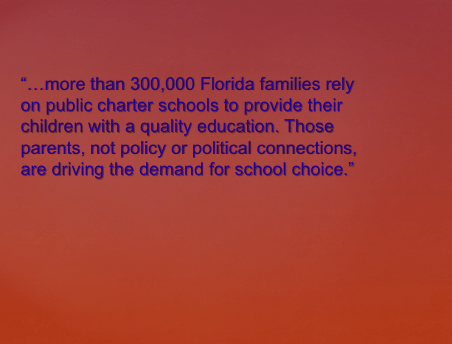 Bottom line, more than 300,000 Florida families rely on public charter schools to provide their children with a quality education. Those parents, not policy or political connections, are driving the demand for school choice – that includes magnets, academies with district schools, charters, and other education choice programs. Who can provide school-based mental health services?